Okay, so I was supposed to be working on my “easy” Simplicity 4074 pattern from my Summer 2008 SWAP, but I ran into few snags. Well the skirt is about done; I just have to insert the elastic in the waist and hem it. The top (the sleeveless crossover with the sash) is another story. I’m just not excited about it, and I kept making little mistakes along the way that just drained the joy out of this project for me. This is another version of New Look 6774, the C+J+L combination. So far I like it, though I did have problems with the largeness of the bodice. I cut out my usual 12, but it is definitely too big and gaped horribly at the top. Because I was so far along and did not want to take everything apart, I added tucks to take up the slack. I don’t think it looks too bad, and almost looks like it’s part of the design. Some people may consider this sloppy sewing, but so be it; I never claimed to be a fitting expert. You live and learn. If I make this view again, I know I can cut out a 10 and add darts to the bodice to make sure it really fits. Here’s a close up of the pocket. I used my blind hem foot for the edge stitching, and I think it looks pretty nice. 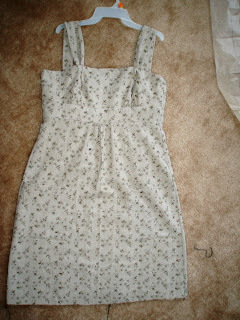 To finish up this dress, all I need to do is to insert the zipper, adjust the straps, and hem. I’m debating on whether or not to add the bows the to straps. Hmm…we’ll see. I can’t wait to wear it to my friend’s July 4th cookout! Very cute!I like that fabric! I have also had sewing that I had so many mistakes that I just put it up and forgot about it.I am glad you keep with your’s.